Pamela Jones is a self-professed yogaholic with a severe case of Wanderlust. She is an award-winning International photographer that creates images that captivate, intrigue & inspire. 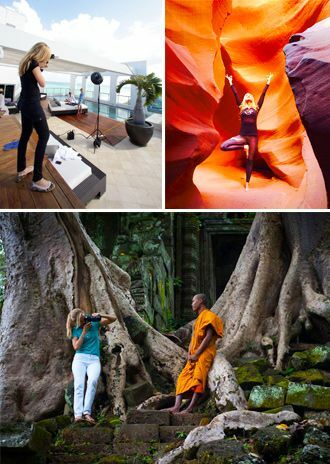 She produces innovative photography for editorial and advertising clients world wide with a client list that includes Conde Nast Traveler, Disney, Forbes, Diageo, Yachting, Yoga Journal, Rolls Royce,The BBC and recording artist Jimmy Buffett. She donates her photography skills to Operation Smile missions in Southeast Asia and NGO’s in South Africa working with HIV + Woman and Children where she also started a yoga program. She has worked with Matt Damon’s Foundation, Water.org shooting documentary photos of their projects in India.She also organized a show of her work from Haiti to raise money for relief organizations working on the ground there. Her on-going body of work is titled “Wanderlust” and is collection of photos from over 30-countries on 6-continents around the world. Her passionate interest in People, world cultures and travel are guiding forces in her work. She currently divides her time between Miami Beach and the South of France. She approaches each assignment with a high level of professionalism that is necessary for producing outstanding images and can customize her production style to meet the needs of each assignment whether large or small. She loves working with like-minded people and welcomes the opportunity to discuss your photographic project be it stock or assignment.